I believe we heal ourselves through movement. There is a book I bought as part of my Brown Belt training in the Nia® Technique years ago. It’s called, BodyStories by Andrea Olsen. It’s about our body’s intelligence and how movement of humans and everything around us affects our life. I had a powerful experience in today's class of reclaiming my body, especially my shoulders and upper chest -- my pectoral muscles. I felt their strength and vitality and I could almost say, "power," for the first time in my life. This is a big deal. The awareness this person had of how they were moving, and discovering something new in their movement, allowed a feeling of power to come through. Conscious movement is known to spark creativity, joy, curiosity and connection with other people. I personally have found that my life is more meaningful through my connection with my body. My wish for you is to explore more for yourself — no matter what movement practice you choose. Doctors, nurses, hospitals and western medicine, in general, get a bad rap (and in some cases, for good reasons). Yes, there are many terrible stories of things that do go wrong. But how often do we hear about the times when things go well? I had not one, not two, but three positive experiences at St Clare's Hospital in Denville, NJ over the past years. One incident happened last week. I went to the emergency room because of strange things going on with my speech. From the moment I walked in the door, I felt safe and cared for as I was whisked away. In a matter of minutes there was a team of nurses and practitioners surrounding me and doing their thing. One ER nurse asked if I had dinner and she got me a sandwich and drink because the cafe was closed. Another ER nurse brought me several heated blankets. The triage nurse had a fantastic sense of humor. The technician who did my scan took time to make me feel comfortable. Once I was admitted, the attending nurse apologized in advance that she would need to wake me up every 4 hours. I did not even felt the pick from the phlebotomist. The doctors took their time to discuss what happened afterward and offered their recommendations in a kind manner. I felt cared for and treated like a human being. Most importantly, I am feeling better. Here's to all the nurses, doctors, practitioners, hospital and office staff and EMTs who do your jobs SO well, and probably do not receive the thanks you deserve. This acknowledgement is my heartfelt appreciation. Teresa D'Angelo is a Healing Movement Specialist and founder of Live Love Move, offering classes and programs for people with chronic pain. Contact Teresa for more info. You might have had similar experiences in life . . . you feel alive and excited about a new "something" or "someone." You land the job and career path you've always wanted. You move to the place you've dreamed about. You start school (again). Your soul mate appears. Your world is vibrant and you can't wait to get up in the morning! Over time, life becomes routine. Weeks, months or even years later, you might ask yourself, "why did I choose this path or this person?" As stated in The Fifth Agreement by Don Miguel Ruiz and his son Don Jose ". . . all humans live in their own world, in their own movie, in their own dream." It is our personal experience and perception of life that matters. So how do we get back to a fresh start? The meaning of Shoshin in Zen Buddhism is to have an attitude of openness, eagerness, and lack of preconceived notions. but in the expert's there are few. We follow the practice of Beginner’s Mind in Nia by paying attention to body sensation and what is, in this moment. No matter how many years of experience dancing or teaching, we can come back to the basics. This past summer, Debbie Rosas led a "Festival of Nia" in New Jersey (video above). We were doing a simple movement together and as I let myself go fully into the motion, tears rolled down my face. THIS was the sensation and feeling that attracted me to Nia in the first place. I found Beginner’s Mind in that moment, being open to the experience as if it was my first class. So how can we experience Beginner’s Mind more often? Look at the trees, the sky, and the gift of colors on your drive to work or to school. Notice the unique qualities in people's faces on the bus or train ride. Use the computer or phone to share your words with impeccability. Treat clients as if you're hearing them for the first time, without judgment. Acknowledge "Namaste" in your partner, spouse, coworker and friend. Imagine many more possibilities to experience little moments as breaths of fresh air. Then, each day becomes a way to Begin again. Last summer, I was asked to lead a Nia® class that ran for 18 weeks under the Women Veterans Healthcare Program at the VA Hospital in New Jersey. This residential program offers care for women in the military who suffer from Military Sexual Trauma (MST) and Post Traumatic Stress Disorder (PTSD). Prior to teaching this class I was unaware of MST. Veterans who experience MST and combat exposure are prone to depression, suicide and substance use and abuse. Women who were suffering with MST and PTSD came to Nia class. Some had experience with yoga and dance-type classes, others were into sports and some had injuries which made it difficult to move on their feet. Everybody was new to Nia. Each class was a learning experience and moods varied week-to-week. I had the highest respect for each of them yet I could not know what they were experiencing inside. I chose to share my personal experience of feeling disconnected from my body through illness for years and how Nia helped me reconnect with myself. Sharing my story seemed to help. There were times when someone became "triggered" and left the room. The program psychologist and staff where present to assist and dance with us. I believe their presence helped put the women at ease and let them know they weren't alone. Movement was simple and there was a sense of accomplishment as steps became familiar. We laughed a lot while dancing our "moves” in the circle (these ladies could move and I learned!). The music invited expression and healing. One of our favorite songs was Lay Your Sorrows Down from the Nia routine Joy. One woman who left the room during the first and second classes returned. I let her know how courageous she was to come back. She didn't have to take the class, yet she had returned for herself. She came to every class until she was discharged. Witnessing her connect more with her body was remarkable. Women left for home and there were tears, along with hope and confidence as these brave souls moved on with their lives. I felt I could "hang up the armor” before walking into class. At first I felt awkward, but I got the moves over time. I could move my way. I am more in touch with my body. I felt at peace by the end of class. I will look for a class when I get home. This is wonderful work. Thank you for coming. They thanked me. Yet it is each of these women that I have to thank from my heart for their courage, persistence, and service to our country. They taught me what it means to be brave. This is the power of therapy, compassion, and movement. I am honored, humbled, and most grateful this experience was made possible through a government contract between Benessere, The Center for Wellness, in Summit, New Jersey, and the Veterans Health Administration. Their hope is to acquire further funding to continue this type of program in the future. Teresa D'Angelo is a Nia 1st Degree Black Belt and Healing Movement Coach, specializing in classes and programs for people with chronic pain. She teaches classes at Benessere and other locations in Northern NJ. Visit here for more info. It's election day and time for a change. The truth is, I have not been feeling well. My energy level dropped way down, I've been tired more than usual. Maybe part of it was the election this year? In any case, I could feel my body saying, HELP ME! I own my part. I have reverted to consuming more sugar. It crept in innocently. . . a nibble here, a drink there, another nibble here, and so on. I don't feel guilty. It's what happened. The good news is, my body has spoken, and I'm listening. I have decided to do another 21-Day Standard Process cleanse under the guidance of my wonderful chiropractor who got me started. If you're interested to hear about it and how it's going, take a peek at my Day #2 video. You might know my story with Rheumatoid Arthritis and, if not, you can read more here. I understand severe chronic pain. The SP cleanse was one of the puzzle pieces that showed me the inflammatory effects of sugar-- and how those effects could be lessened by eating whole foods and eliminating foods that were wreaking havoc. My goal was to feel better in my joints, yet I also let go of 30 pounds over two years. I have received a lot of questions over the years about this program and the most valuable one is that it kick-started me to shift my eating habits long after the cleanse ended. When I stick to eating better most of the time, I feel energized and my joints feel better. I started the 21-day Standard Process cleanse again on November 7 and will be vlogging once a week so you can witness any changes that happen. I'll give you the good, the bad and the ugly! By the way, I have never worked for Standard Process nor do I receive perks for writing about their company. This cleanse helps me feel better and I wanted you to know about it. There are many wonderful whole food programs, doctors, coaches and nutritionists who can guide you. The SP cleanse is intended to be done under the supervision of a professional and I would be happy to make suggestions. So, here it goes. Day #2 Diary of the 21-Day Purification program! Sign up to receive this weekly Vlog update direct in your mailbox! Disclaimer! I do not work for Standard Process Whole Food Supplements nor do I receive a discount or anything from their company. I'm simply writing because their 21-day Purification has worked for me more than once. To learn more about whole foods, there is a free online Whole Food Summit happening this week! My friend, Alyce Osborne, is one of the speakers. Do you have a community of people that you enjoy being around? Maybe it’s your family, friends, or a group with a common purpose. I don’t know that I would have the same relationship with my body today had it not been for the practice of Nia and our NJ community. The power in our community is Heart. I had a profound experience this past weekend. One of our Nia instructors and dear friend, Kim Lane, is moving to Nashville as I write this. We knew for almost a year this day would come and we held a farewell “Nia Jam” (an extended class with several instructors leading). The theme was appropriately named “Memory Lane" and the entire Nia NJ community was invited. Heart warming Smiling and crying, moving to many of Kim’s favorite songs and feeling the emotion and power of connection in the room. Heart wrenching Feeling heavy because of the impact she made on my life and our community. We are feeling a big space, which shows how much we love her. The power in our community has been life changing. Community requires a vision and people who keep the vision going. Thanks to my other dear friend and retreat co-creator, Lori Lynn, who started Nia NJ in her living room about 10 years ago with 3 of us and a simple idea. Soon afterward our group began to expand and we have since grown into a vibrant community. It is a community of heart. We laugh together, support each other, and cry together when people we love move on. This morning, I was thinking about close friends in my life. Some friends I’ve known for 40 years, some for 10, and some for less. As I get older, I realize how important communities / tribes are for me, to grow friendships and to help each other. Nia NJ is a group of people who found each other through common interest in a state-of-the-art movement practice. I found Kim through this community. Her friendship inspired me to discover another part of myself – a playful part that I adore. While Nia isn’t for everybody, it is for me and I am grateful. Ever since my first class, my vision has been to help people in pain feel better. I did not realize how much I would receive in return. If you are searching for a community of people who love moving without judgment, join Teresa for weekly classes. See nianow.com/Teresa for current schedule. She also holds special movement programs for people with chronic illness. For a weekend of community, movement and self-discovery, join Teresa D’Angelo and Lori Lynn Meader for the 5th annual Dwell In Possibilities Retreat for Women, August 26-28, Lifebridge Sanctuary in Rosendale, NY. www.live-love-move.com/retreats. The Autumnal Equinox is a time of celebrating what we have sown. All comes into balance with equal day and night as we begin to transition with nature. The sun shines brightly as the air starts to cool. Since it is nearly time for much of our plant life to end its cycle of growth, the leaves put on a beautiful show of their magnificent colors before they fall from the trees. The longer, chilly nights sometimes make us start to crave warm spices and foods. Personally, I enjoy warm weather and could live at the beach all year. I go into autumn with a little bit of trepidation because I know the cold weather is coming. However, my son was born on September 21, so the change of seasons is also very special to me. When he arrived my life changed forever. I connect his birth with my own transformation each autumn. As he continues to grow and change in college, my own life grows and changes as well. How can we help ourselves embrace the change of seasons? By moving body, mind and spirit, of course! First and foremost, BREATHE in fresh air. Imagine it going all the way down into your hips to fill your lungs. Even on your busiest days, step outside your home or office door and take a few deep, cleansing breaths of the crisp air. Take a walk outside. Pets who need exercise can help us with this one. You can also step out on your lunch break for a few minutes and stroll around your office building, parking lot, or neighborhood. The movement will help clear your head and make you fresher for the afternoon. Take some time to play! If you have leaves to rake, jump in the pile when you’re finished raking! Instead of buying your apples from the store, go out and pick your own. And who ever said that only kids can carve silly faces into pumpkins? Choose a pumpkin and let your creative juices flow. Try that new movement class you’ve been thinking about . . . how about a Nia class? Nia is a practice that will condition your body, bringing balance to your mind, emotions and spirit. Go camping or take a retreat in nature. Search for the types of retreats you enjoy, like hiking, yoga and spiritual studies. You might even choose the one I'm co-hosting for women in October in New York. Dwell in Possibilities will give you the opportunity to ignite your fire and awaken your passions. Finally, for warming you on the inside, add cinnamon, nutmeg, turmeric and other spices to your drinks and food. One of my favorites is butternut squash soup! However you choose to celebrate the beautiful season of autumn, keep conscious movement a part of your life. If you are in the New York/New Jersey area, you can find a list of upcoming classes and workshops here. Simplicity is a wise teacher. My practice of conscious dance continues wherever I go. I had a beautiful surprise when I was on Maui this summer. I picked up a copy of Maui Visions in a cafe and saw an ad for "Beach Dance." Music, nature, community AND dance. . . how could I possibly pass this up?! The stars were aligned because there was a dance on the beach the next evening. Lila Danielle, the founder, met us at one of the beautiful beaches near where we were staying (btw, I don't believe there are any ugly beaches on Maui). She led us on a short walk to a quiet area of the beach. It was late afternoon and it was perfect. Each of us received a waterproof iPod shuffle and headset to use with a one-hour playlist. We began with an introduction and intention and then started our shuffles at the same time. The dance began. Sometimes on the sand, sometimes in the water, connecting to someone else, nature, the music, and self. It was a most beautiful, peaceful experience. It was SIMPLE. If you visit Maui, look up Lila Danielle and Beach Dance. She is a lovely soul, helping people find their way through dance. We are kindred spirits. It's easy to be inspired in a new and comfortable environment. Everything seems shiny and there is fun in discovering. Vacation is a way to shift routine and perspective -- to experience something different -- or to experience the familiar in a different way. Wouldn't it be nice to bottle inspiration and spray it on when we return to work and daily living routines? I think the answer is, we can, by experiencing inspiration in the simple things. I am inspired with a deep peace I feel each time I visit Maui. 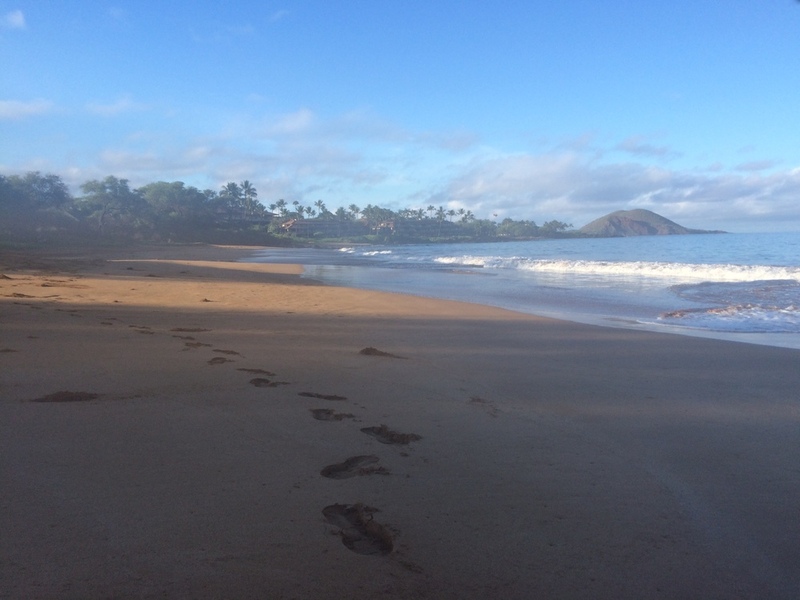 This is home for my soul and I feel the spirit of Aloha -- which I translate as connection and respect for life force, nature and people. The truth is, inspiration is always around us, if we seek it. When I'm back in New Jersey, my "bottled inspiration" is a walk outside with our dogs, having lunch with a dear friend, appreciating the flowers in my garden, dancing, music, and smiling. Inhaling the breath of life each day is the real vacation. Try a movement class for inspiration and upcoming Dwell in Possibilities Retreat for Women!